Above: Celebrity Equinox docked in Roseau, Dominica. 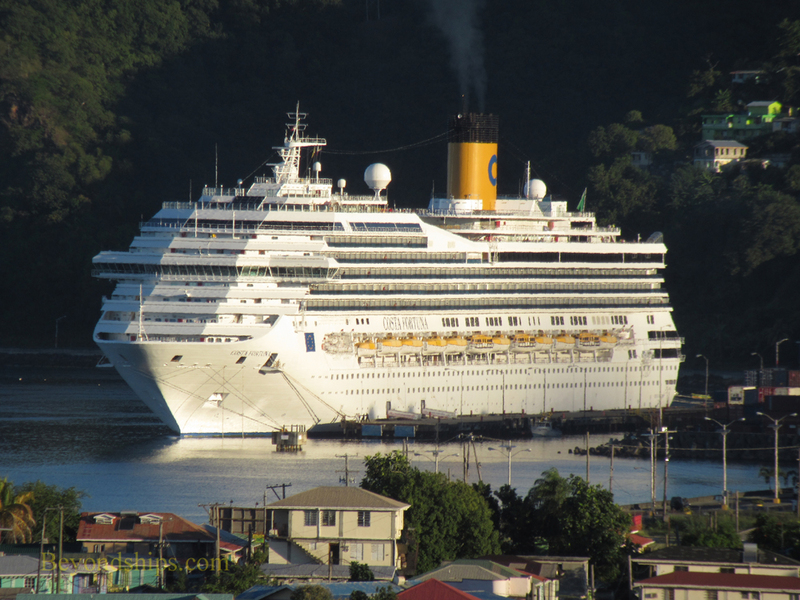 The peak season for cruise ships in Dominica is from November to April. 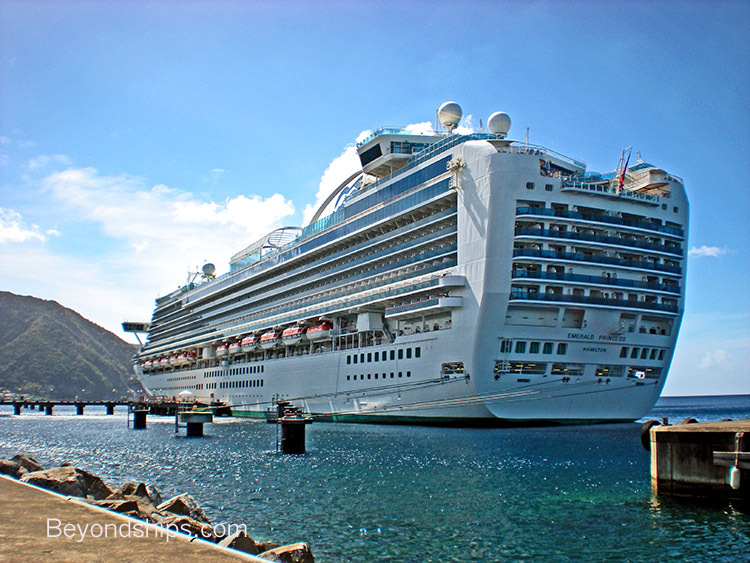 In recent years, the number of cruise ships calling at Dominica has increased significantly. 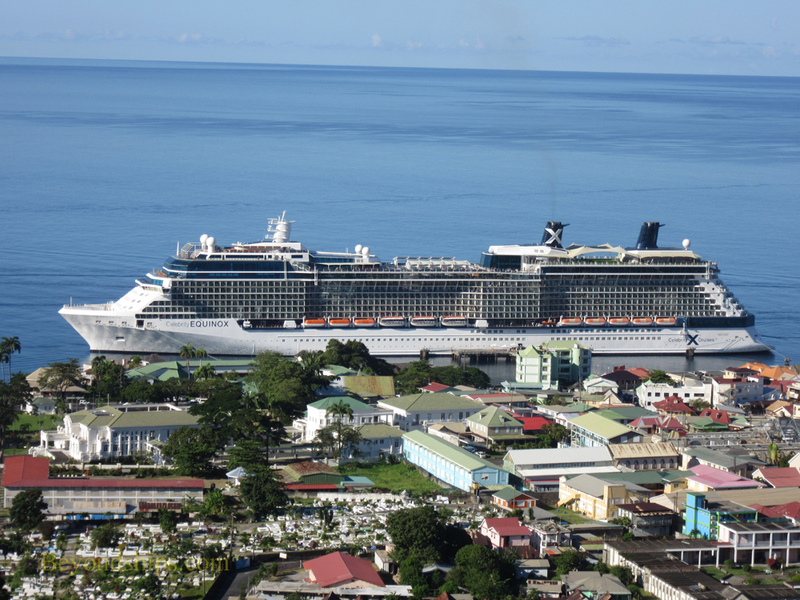 Nearly 200 cruise ships were expected to call in Dominica during the 2014-2015 season. Cruise visitors now make up the vast majority of tourists who visit the island each year. Most cruise ships calling in Dominica dock in Roseau. (A few smaller ships call at Cabrits near Portsmouth on the northern end of the island). Some ships anchor offshore and tender passengers onto the island. In Roseau, there are two places where cruise ships berth. The most convenient of these is the Roseau Cruise Terminal (sometimes called “Bayfront”), which is in the center of Roseau. There is no terminal building. Rather, the terminal is a small T-shaped pier. The ships dock parallel to the top of the T and thus parallel to the shore. Guests then walk a short distance down the neck of the pier into town. The other berth is at Woodridge Bay (sometimes referred to as the “Deep Water Harbour”). This is primarily a cargo facility but there is a sidewalk leading into the main part of Roseau. It is a considerable walk but passengers do make the journey. Roseau is small enough to walk around. However, most of the town has not been developed for tourists. An alternative is to take the open air tram that circulates through the town. To see attractions outside Roseau, the alternatives are an organized tour or a taxi. The taxis in Dominica are usually vans. Drivers wait near the cruise ports hoping to fill their vans with passengers for a tour of the island. 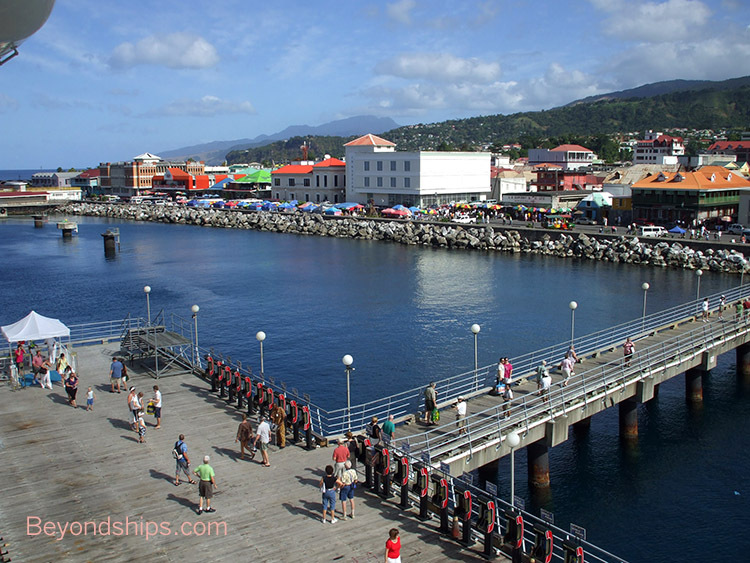 Although a significant number of cruise ships call in Dominica each year, the Roseau is not dominated by the chain stores that appear in all the most visited ports. As a result, shopping is mostly limited to craft items and souvenirs from the small shops and stands in the town. Above: Emerald Princess at the Roseau Cruise Terminal. Below: It is a short walk from the pier into the heart of town. ﻿Above: Costa Fortuna at the Woodridge Bay facility outside of Roseau.